The original author, Lloyd Darland put it this way, "The book is about the difference between Federal Reserve Notes and honest money." And over 30 years since its first printing, the subject matter couldn't be more timely than it is right now. That's because the circumstances Darland wrote about are playing themselves out today, exactly as he described! 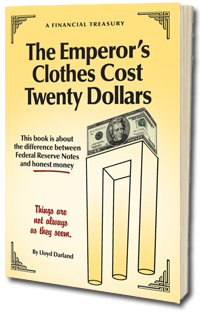 The Emperor's New Clothes Cost Twenty Dollars exposes the deceit behind the creation of a central bank—The Federal Reserve—masterminded by lawmakers and bank executives all those years ago to steal your money through inflation, and supported by the fraud and illegalities of the Federal tax system! How a banking crisis was fabricated to deceive the American people by an American president! How lawmakers used doublespeak to convince the American people a central bank would be beneficial—to them! That the author believed so strongly in exposing this deceit to the American people that he risked his personal freedom! And how your own government first began stealing the wealth of Americans through the unConstitutional Federal Reserve in 1914—and is still doing it today!